1) Why would the center ones not work, and the left and right vents work fine? The center vac elements must be weak or something, if they're the ones to usually go bad. 3) Is there any way to fix the vac elements, or do you have to buy new ones? 4) Are these vacuum elements also what others are calling "pods"? 5) I guess the only real way to get to the center vac elements, is from under the dash, or remove the air bag (I don't have a glove box). Can't really get to them by taking the plastic center vents out? Just one of those things, not sure why. I would think and hope so too. If you search you can see that some have tried repairs, but I think the consensus is no, just get new ones. 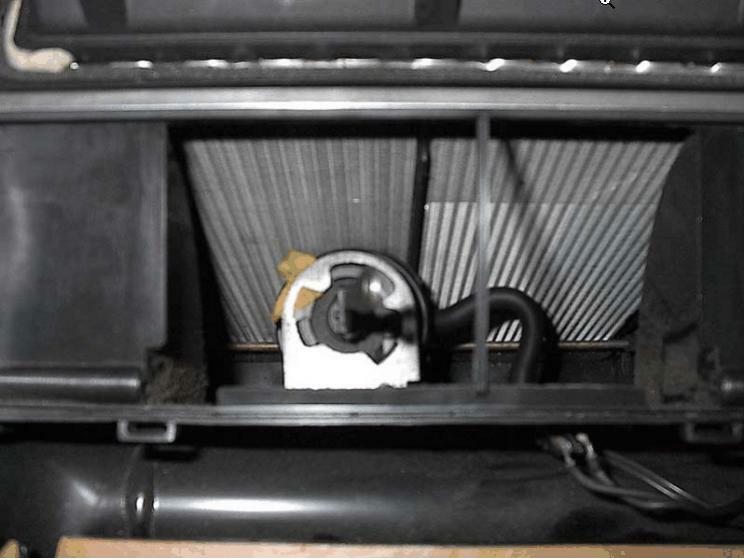 5) I guess the only real way to get to the center vac elements, is from under the dash, or through the glove box, is that correct? Can't really get to them by taking the plastic center vents out? 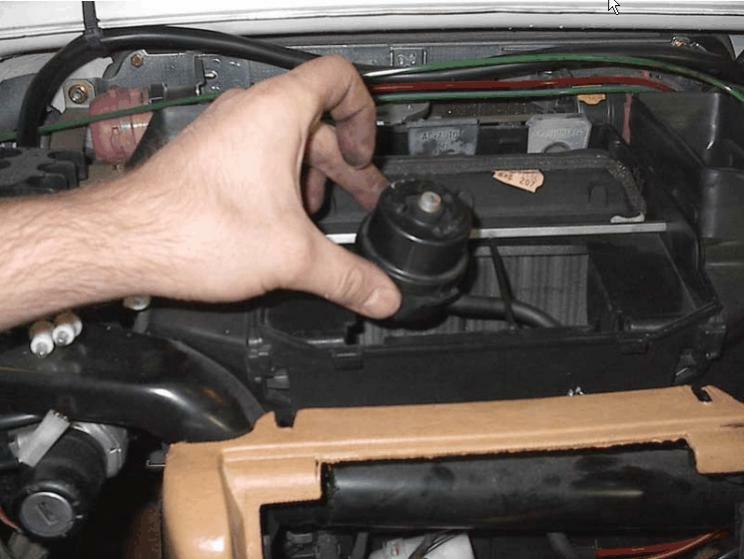 If your '91 has a glovebox, you can easily pull the liner out and see the center pod / actuator. I have not done it, but it looks like you could also change the pod through there, but others have more experience on this I'm sure. Dash a couple of times a year. Oh,Yeah ...You ain't getting to the Center Flap Pod through the Glovebox ! Last edited by compress ignite; 12-03-2009 at 04:41 PM. There is a door that is opened or closed by the vacuum element to permit or block air at the center vents. The side vents have no such thing; they are always open - heat, cold, a/c, defrost - you name it, they blow. The only way to close them off is with the manual dial at the vent itself. The defrost vacuum elements are two stage, permitting the defrost to be mostly closed or completely closed. Commonly one stage fails, so the the defrost door does not close all the way. The best way to check is with a handheld vacuum pump equipped with a vacuum guage - AKA Mityvac. Pulling the glovebox or passenger airbag gives easy access to all seven vacuum lines feeding the various vacuum elements. All should hold a solid vacuum. There are repair kits out there, but noone seems to have had much luck with them. Buying new is the way to go. Yup, just think how much typing has been saved over the years! 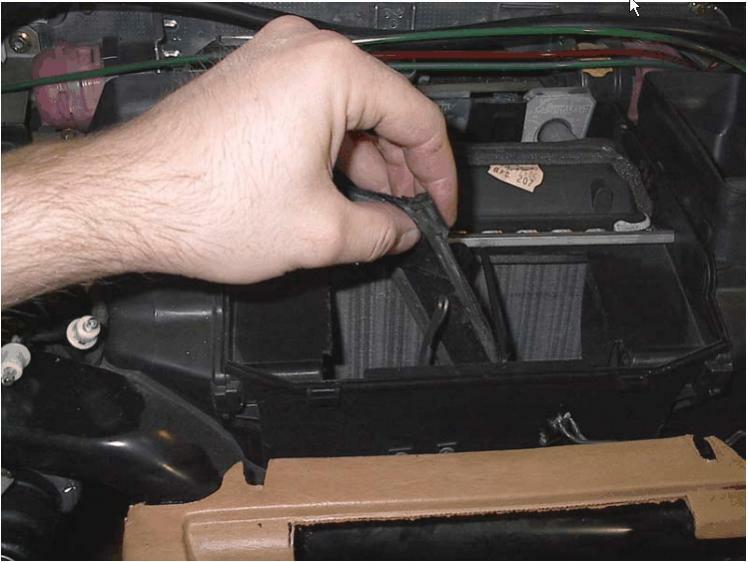 Your car has a single rectangular pod for the footwell flaps; it can be replaced by removing the ACC and other switches in the upper console area. (Early 124s have two round pods, one for each footwell flap.) The defrost pod can be replaced by removing the glovebox. All others, including especially the center vent pod, require removal of the dash. Removal of the dash is not a major job, just time consuming. There are several good DIY threads on this forum; the stuff Sixto has written is among the best as it has good photos. It is not necessary to pull the steering wheel. The single-action pods can be taken apart and the rubber diaphragm replaced but the double action pods cannot -- one of the two diaphragms is NLA. In any case, given the effort needed to get at the pods, it is definitely smart to replace/rebuild all of them while you're in there. This is also a good opportunity to do a thorough cleaning of this area as well as replacing any other components (lamps, relays, etc.) that have failed over the years. I spent about $200 for a complete set of pods. To prepare, read every DIY thread and post about dashes and pods that you can find. Make a list and buy pods and/or diaphragms so that you will have a complete set. Make sure you have any necessary special tools. For the first time, allow a complete day. You do not need a helper. Go easy on the beer until you're finished. Turns out that when you use the heat, the center vents do not work, the floor vents work instead. When you switch to cold air, it takes a bit of time for the vacuum pods to go back to the center vents, maybe 20-30 seconds or so. Ah, you didn't know that? It has been mentioned so often here that I guess we assume everyone has the word. Sorry. You can 'wire' the center vent to be open all the time by removing its vacuum line from the manifold and teeing it into the supply line. That way it always gets vacuum and is always open. Remember to cap the port in the manifold (it is #4) so you don't create a leak. You can do that work by removing the glove compartment, no need to pull the dash. I don't know what folks with passenger air bags do.